So, winter finally arrived with two weeks of sub-zero night time temps and days sometimes in the single digits. The sheep are locked safely in the barn, and our feral cat has figured out I am the source of food, and he letting me pet him a bit. The chickens and ducks have declared a truce, of sorts, in the big coop. We thought we had butchered all of our female ducks, but apparently they were just late bloomers. The chickens are struggling in the bitter cold, but the ducks have been faithfully laying an egg a day! As for us, we are hunkered down in the guest house, weathering the weather. Today was warmer – too warm, too fast. It snowed several inches, then everything began to melt. When this freezes, it will be a mess! Well, here we are, facing another fall; summer seems to have left us in the dust (literally.) We finally got some rain last week, but it was not enough to replenish our pond, which is down six inches at least. 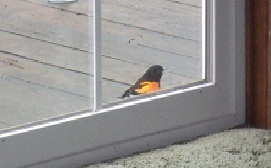 Summer is always a busy time on the Ridge, but this year more so than normal. In addition to the harvest, which waited until the last minute and then came on like gangbusters, we were in the thick of family issues, property maintenance, and just plain “life.” You all know the feeling I’m sure. June found us planting our gardens very late (for us.) The strawberry patch was pretty much a loss (again!!!) And we ended up tilling it under. We only got a handful of raspberries from our new patch. The blueberries did “OK” – we were able to put some of those in the freezer, thankfully. 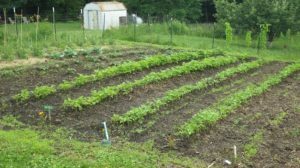 By the end of the month the peas were on; we planted sugar snap peas this year instead of the traditional Wando, and the sugar snap did not do as well as we had hoped. We ended up eating a few batches, but none for the freezer. 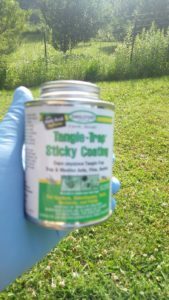 Coccidiosis broke out in our meat chickens, and we lost quite a few before we could get it under control. Such a deadly disease, and so fast moving! Our daughter was home for the entire month of June, so our family was expanded from 2 to 7 for the month. It was great to have the grandhildren home, but, as you can imiagine, running a busy household of that many people made the month go by pretty fast. We butchered our own chickens this year to save some money, and that went pretty well; we put 24 birds in the freezer (out of an original count of 30) in two batches, each batch took about 3 hours to process. We skinned them rather than plucking them; and rather than putting them in the freezer whole we elected to cut them up and freeze them in portions so that they would be more convenient for us. July was hot and dry; and we didn’t water the gardens nearly as much as we should have. We made several trips to Pittsburgh for doctor appointments (yes, we’re getting to be that age), hosted several family get togethers and kept grandchidren, and generally tried to keep up with life. We started the Bright Line Eating diet together after my sister bought us the book. It seems to be working well for us and we were pleasantly surprised how well it fits our food philosophy – we’re finally eating the way we’ve always encouraged others to eat LOL. Chickens still seem to be our “game.” One of our laying hens was determined to set, despite our best attempts to discourage her. We finally broke down and went to a neighbor and purchased a clutch of fertile eggs. The hen’s hard work paid off when she hatched 7 little chicks;. Our friend has a “colorful” flock with several different breeds, so now we do, too! We also started a second batch of meat chickens, and those have done much better than the first batch, with only two lost this time (so far.) We may consider raising all of our meat birds later, rather than earlier, going forward. August has found the garden finally producing – carrots, kohlrabi, cabbage, tomatoes and – wonder of wonders! – corn. We’ve never had a decent corn harvest on the Ridge, so we were glad to have something to get excited about. The big news of August is that we are moving. Our oldest son is buying the big house, and we are hoping to build on the other end of the land. Thus we will have some of our grandchildren close by to help again, we will be able to begin the process of “downsizing” while staying on the land, and hopefully we can engage with another generation to pass along the knowledge, skills, and values we’ve been accumulating. We are trusting God for wisdom and guidance as this new part of our journey unfolds. 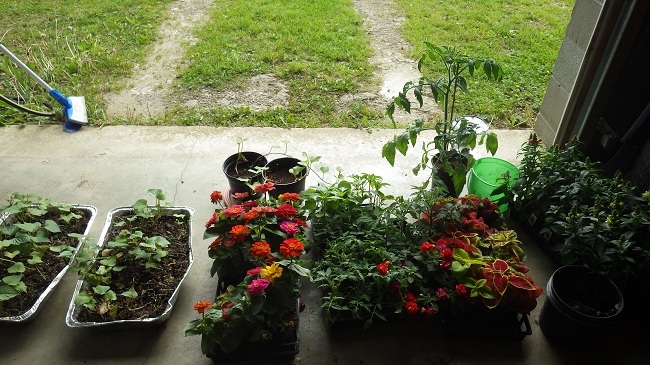 May/June is the season of planting at Big Oak Ridge. This year we have three gardens going, although the newest one is barely “broken in” – we just threw some corn in it for this year. And of course, I’m a fool for flowers. It’s dangerous for me to go to the greenhouse; I always spend more on inedible plants than the edible variety. 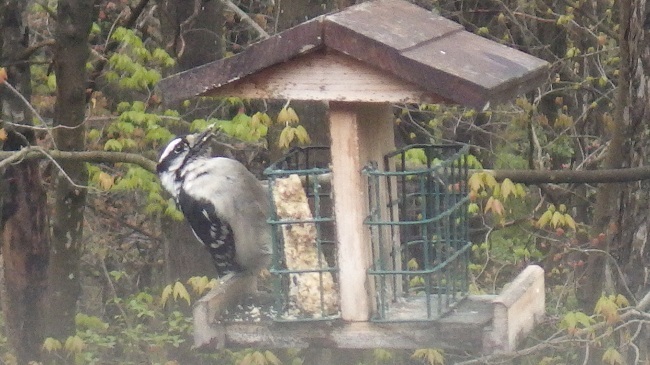 Spring is the time that birds start coming back to the Ridge, and we try to be ready with the feeders loaded. A Tool Apron is a handy thing on a small farm! We LOVE squash! 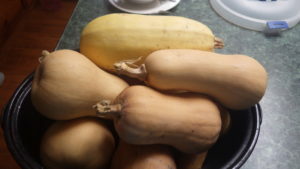 Zucchini in the summer and butternut and spaghetti during the.winter months. Did you know their are two kinds of squash-summer and winter? Summer squashes are soft and cannot be saved for long periods of time. Yellow crooked neck and zucchini are two kinds of summer squash. 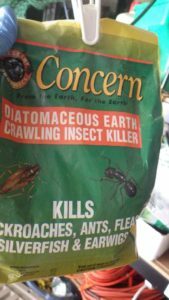 They taste great fried, spiralized, added to stir fry and even raw. We eat summer squash almost every day during the summer season. 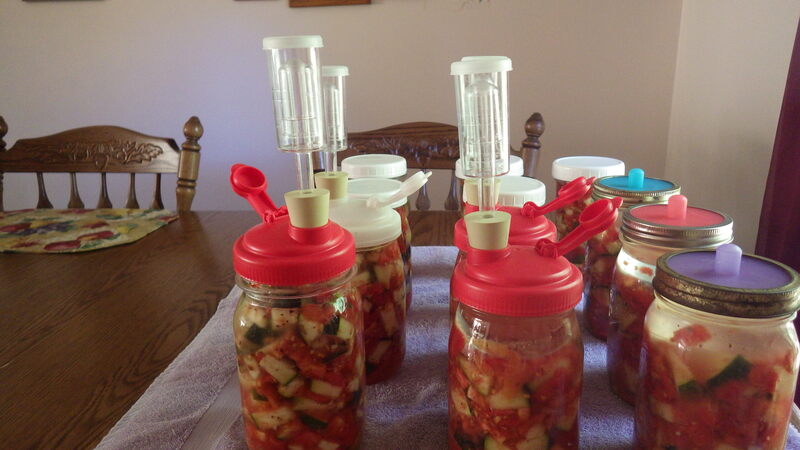 This year I even tried to preserve some by dehydrating- I add it to meatloaf or soups. I also juiced some and froze the juice for winter juicing. We have friends that dry their zucchini into powder and add it to smoothies during the winter. But it is best when it’s fresh. Pick at various sizes-tiny for raw munching, medium for “lasagna noodles” and larger for spiralizing….zucchini is great! 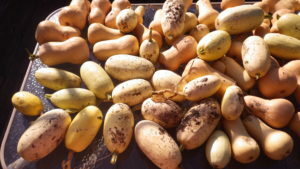 Winter squash is hard skinned and can be kept most of the winter if you cure them by leaving them outside drying in the warm fall sun for a couple of weeks. 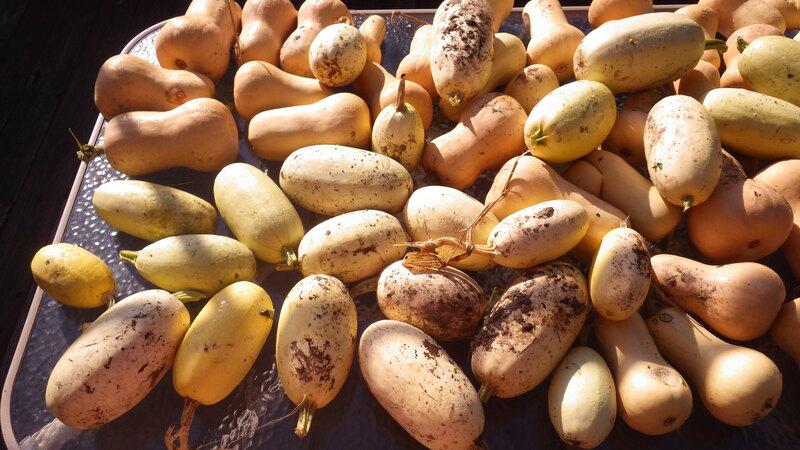 After we cure the squash, they spend the winter in our unheated garage and we enjoy fresh squash most of the winter. If I start to see signs of mold or softness, I steam them to remove the skin and put them in zip bags in the freezer. We can keep eating squash all summer until the next crop ripens. One of our winter staples is butternut squash. Each week I steam and puree a large pan full. We love pureed squash instead of mashed potatoes and we also like butternut squash soup. I am going to try a butternut squash lasagna. I have had squash made like scalloped potatoes but I’ve never made the lasagna recipe. We like spaghetti squash too-not as much as spiralized zucchini but it works as a winter replacement to pasta in many casseroles and even in place of noodles in chicken noodle soup, if you’re counting calories or going grain free. Time for me to get busy…this week’s pan of squash is waiting to be prepared. What is your favorite kind of squash? Fall blurred right into winter as we undertook a MAJOR remodeling project. We tore out the walls of our “retreat”, a small den adjoining our master bedroom, to enlarge our dining room. We will miss our cozy nest; during the long winter months it was our favorite evening spot for reading or watching shows. We replaced the front door, ripped up carpet, spackled holes and painted to get ready for Thanksgiving company. 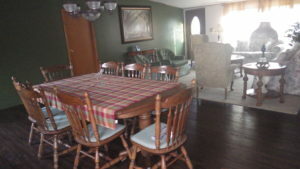 When our last minute attempts at flooring failed, we quickly purchased a $100 rug and frantically tossed the furniture back in place with just minutes to spare before our first group of kids and grandkids arrived. The newly expanded room is 20 x 30 and accommodates our Amish table extended to its full 12 feet. Our family was all together for the first time in 3 1/2 years. It was loud and crazy with 24 for Thanksgiving dinner and 10 overnight guests. We had a grand time reconnecting, playing games, doing crafts with the kids, and feasting! Early December Hubby traveled on business. As a surprise, I repaired the bedroom side of the retreat door, repainted our bedroom and redecorated. Four of our older grandchildren were here and they pitched in to help with the project. Hubby was very thankful that he didn’t have to do that job. 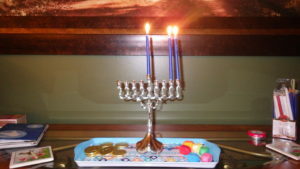 We celebrated Christmas and Hanukkah this year. Mixing some of our old traditions with some of the newer things we are learning in our Bible study. It helped that they coincided this year. After the holidays, we resumed the remodeling project and the new flooring was laid. 600 square feet!! We are slowly trying to get the house back in order before it’s time to start thinking about planting. The weather has been odd…lots of snow, followed by days of torrential rain and flooding with temperatures between -10 and 60 degrees. Sometimes with 30 degree drops in just a few hours. As we continue to finish indoor projects and prepare for tax season, my crock pots are getting lots of use. I have always been a big fan of the crock pot but as our family moved out, I used them less and less because they were just too big for the two of us. 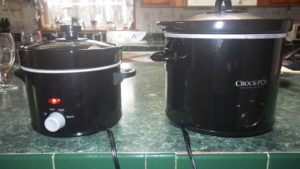 For Christmas I was given a gift certificate and purchased two smaller crock pots. One 4 quart and one 2 quart. I am in love with crock pots again. Today is another dull gray afternoon and I have both pots working on dinner. The larger is butternut squash soup and the smaller, tapioca pudding. Almost one month into winter and we’re hanging on with hopes of spring. What’s new at your place? 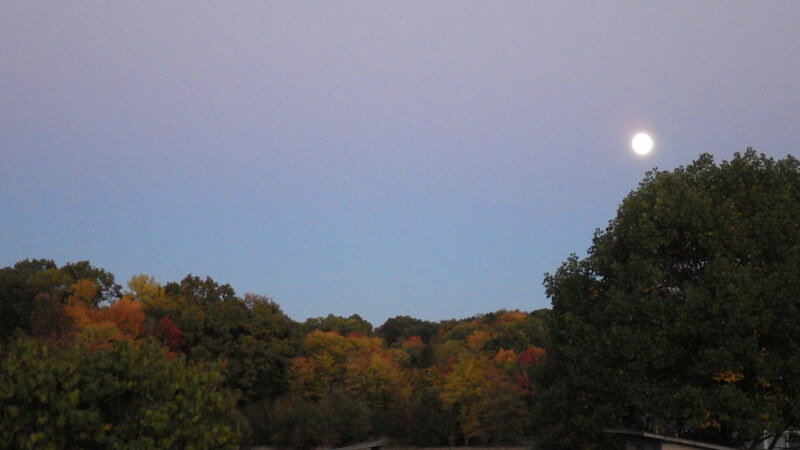 Fall is an enjoyable time on the ridge; the harvest is mostly in, the days are slowing down (in part because it gets dark earlier!) and it’s a good time to pause and reflect on all of God’s goodness. It seems like every year some things do well on the farm, others don’t. We got a lot of apples again this year thanks to some dear friends. Ours produced, finally, but not enough to do anything with. We got some pears and some peaches, but mostly we have to buy our fruit, or barter for it. For the first time that we can remember, our green beans did very poorly. We don’t know why, and this is real loss for us as green beans are one of our “staple” crops. Our strawberries did very well but unfortunately we were not home to harvest them so we bartered them in exchange for the woodchuck elimination and critter sitting while we were on vacation. The squash were the big producers this year, including butternut, spaghetti, and zucchini – I still can’t believe all my years growing up I never ate zucchini now I love it! We also have enjoyed using our “spiralizer” to make zucchini spaghetti. The tomatoes were prolific but not very healthy. Last year we had blossom end rot; this year we were overrun with mice. They would eat the tomatoes right when they got ripe, so we had to pick them early or lose them. We got some soup and some salsa, but no spaghetti sauce and not much juice. We got some root crops: turnips, sweet potatoes, red potatoes. We also got some kohlrabi – a new addition to the garden for us, and one we will definitely grow more of in the future. 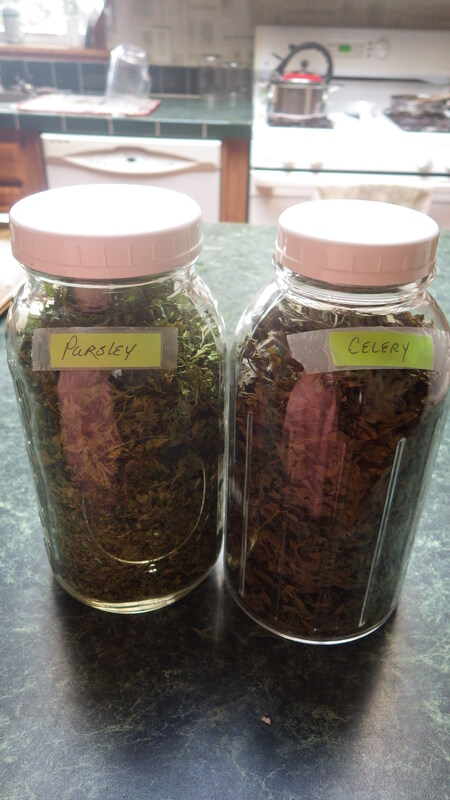 Paula was able to dry some parsley and celery, and she also made some dehydrated zucchini noodles for a winter treat. You never know what you will end up with for the winter when you live on a natural farm; but the freezers are full, the canning shelves are loaded,and we will survive another winter (and probably put on a few extra pounds if we’re not careful! Kent received a bat house for father’s day last year, and we have been trying to find a suitable place to hang it. We may have to wait up to two years for bats to find and colonize the bat house; we’ll keep you posted!